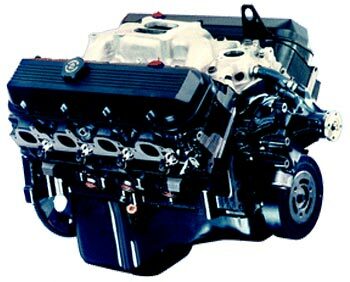 Engines: 438454HO - 454 HO 438 HP Base. from California Marine. Description 454 HO 438 HP Base. The 454 HO offers tremendous value in a big block crate engine. Based on the Gen VI block, this 425 horsepower cast iron head engine is a great choice for that muscle car in the garage. We've heard of several of our customers replacing their rare matching number 396, 427 or 454 with our 454 HO in order to drive their car on today's gasoline without fear of destroying their classic engine. The HO stands for high output, it also stands for big valves, rectangular ports, forged pistons, forged steel crankshaft, forged connecting rods and four bolt mains. Sounds a lot like the performance big blocks of the late 60's doesn't it? When you add in the steel roller camshaft, shotpeened rods, windage tray, one piece rear main seal and high speed single roller timing chain, it starts to sound more like the performance big block of the new millenium. And it is. The 454 HO makes 500 ft.lbs of torque with its rectangular port open chamber cylinder heads. With 118cc combustion chambers, the modest 8.75 to 1 compression ratio loves today's pump premium and has no appetite for lead, octane boosters or other fuel additives. Its 2.19" intake and 1.88" exhaust valves and high lift .510"/.540" roller cam let it breathe with the best of the early muscle motors. With your carburetor, HEI distributor, exhaust system and bright red '67 Corvette coupe (sold separately 34 years ago), you've got a muscle cruiser worthy of your time, effort and expertise. And, if you want to use your muscle car's fuel system with a mechanical fuel pump, you can because the 454 HO Gen VI block has a conventional style fuel pump boss.